Conservation in Common	How an architect and an educator found true love in the natural world. Anyone who knows Angela Dean or Tim Brown would understand why they had an immediate connection when they met as coeds at the U in the 1990s. They not only share a love for Utah’s deserts and mountains but also a deep interest in conservation that has fueled both of their professional paths. An architect dedicated to sustainable design, Dean established her own firm, AMD Architecture, in 1997. Brown is director of Tracy Aviary, which he has dramatically transformed during his 14 years of leadership. 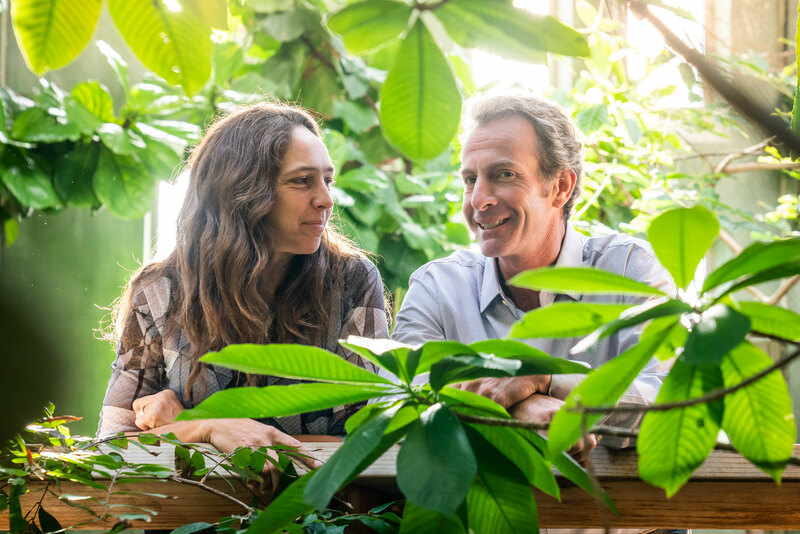 Together for more than two decades, and now with two teenage kids, the couple’s passion for their individual work is entwined with their shared passion for sustainability and environmental education. HER: Dean BS’92 MArch’94 was born in upstate New York. At 15, she moved from Long Island to Lehi, Utah. After attending Utah State University for a couple of years, she transferred to the U to pursue her passion for architecture. “I had many inspiring teachers who made an impact on my development in the field,” she says, mentioning Tom Kass, Bob Hermanson, Tony Serrato-Combe, and Peter Goss. During their studies at the U, she and Brown spent a good deal of time in southern Utah—running rivers, hiking, and exploring the wonders of early Native American dwellings. “This spurred a deep passion to provide architecture that was as naturally harmonized with its surroundings and climate as these cultures had been,” says Dean. To pursue this approach in her graduate studies, Dean was proactive in customizing her own curriculum at the U and received a research fellowship grant that gave her the time and resources to pursue architecture studies outside of formal class time. “It was a game changer in terms of my professional path,” she says. Three years after finishing her master’s degree, she founded AMD Architecture in Salt Lake City, with the goal of providing quality building design that is equally responsible to her clients and the greater environment. Her 2003 book, Green by Design: Creating a Home for Sustainable Living, describes the environmentally responsible design principles she holds dear: to make green building and healthy living accessible to everyone. HIM: Tim Brown ex’90, a native of Salt Lake City, pursued graduate studies at the U after earning his bachelor’s degree at the University of Vermont. He had nearly completed his master’s in education before deciding he wanted to add a community component to his studies, which the U had yet to offer. So, he transferred to Antioch University Seattle, where he completed his degree. Committed to the environment and with a belief that education and conservation were two means by which he could make a difference, Brown returned to Utah with a plan to position himself to lead a top environmental education organization. 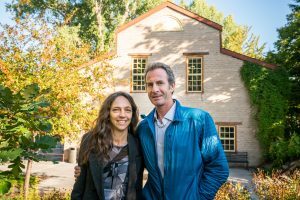 After working for a decade with the Utah Society for Environmental Education, seven of those as its executive director, he found himself drawn to the Tracy Aviary in Liberty Park. After the executive director position opened in 2004, he landed the job. Angela Dean and Tim Brown outside the Chase Mill at the Tracy Aviary. They led a renovation of the building to turn it into much-needed indoor programing space. TOGETHER: When Brown started working at the aviary, he discovered an untapped opportunity to renovate the historic Chase Mill (built between 1848 and 1852) into a much-needed indoor program space. The charming mill is the oldest commercial building still standing in Utah and is listed on the National Register of Historic Places. A previous effort to revitalize it had been unsuccessful. Turning it into a family affair, Dean offered her assistance in programming potential uses of the space, providing designs for renovation, and organizing educational building workshops with volunteers to help complete the project. Dean’s architecture firm received a 2009 Heritage Award for the project, and subsequently a 2015 Associated General Contractors Cultural Award for design of the aviary’s Treasures of the Rainforest indoor exhibit and another in 2017 for its Bird Feeder Café. Dean continues to volunteer at the aviary, including as a participant in its citizen science program, which has more than a half-dozen projects and 100-plus volunteers. “Our kids have also been volunteers (or ‘voluntolds,’ as Tim likes to call it) throughout these 15 or so years,” she says. Brown has been in the nonprofit world about as long as he and Dean have been together. And because the organizations he’s been involved with have been focused on community services that she believes in, too—environmental education and conservation—it has been a natural fit for her to offer support. “It's been an honor to be able to put my skills to use and be a part of that positive change,” she says. Learn more about Angela Dean's professional path in the prior Continuum feature here. These U Kappa Kappa Gammas have stayed close for more than 65 years.